Flip through any fashionable design annual, and you’ll read of something called “Human Centered Design.” The practice of HCD places emphasis on user testing, interviews, field research and high-touch iterations to solve problems. As contemporary design, and especially sustainable design, increasingly comes to rely on HCD-inspired techniques, greater attention is being paid to social features. Diana Sierra and Be Girl have developed their own version of the process, which they call Humanity Focused Design. Despite years of experience designing products for brands like Nike and Panasonic, Diana Sierra felt the need to change course. She enrolled in the Sustainability Management program at the Earth Institute – Columbia University seeking to develop better products, not only those that boosted the bottom line but products that where responsible to the environment and the people. That was the drive that gave way to Be Girl, an idea to create “extremely affordable and high-performance products” that focus on "women’s and girls’ autonomy and confidence” through design. Sierra first came up with the idea of developing a new kind of sanitary napkin after conversations with girls and women in rural Uganda as part of a U.N. Development Program project. She learned that many young women, lacking access to any feminine hygiene products, would miss school when they began menstruating. Her solution was a pad/underwear that may be fitted with almost any locally available absorbent material. In fact, Sierra’s original prototype was assembled from fabric she re-used from an umbrella and mosquito net. This “open architecture” approach to design mirrors how Be Girl’s resourceful design approach delivers maximum impact with minimal materials. 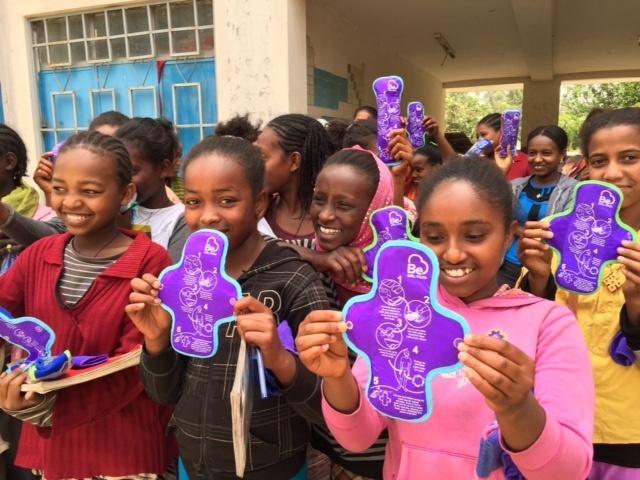 By working closely with a variety of communities to co-create, girls are empowered to develop products that not only responded to their immediate needs, but also reflected their aspirations. Talking about menstruation is not an easy thing, especially when it is taboo or culturally inappropriate to even broach the topic. But “when a stain of blood is standing between a girl and her chance to a reach for a better future, you don’t need to be a designer to figure out that the minimum intervention to level the playing-field for girls is to make appropriate menstruation management solutions as part of the toolkit for girls to stay mobile pursuing and reaching opportunities," Sierra said. Simple solutions can be revolutionary and truly worth giving it all, because every girl deserves the right to manage her body with dignity, and to have access to an education as well as all the opportunities that come with having mobility and autonomy, key components to reach the immense potential that is in every human being. Elizabeth began her career introducing leading international brands, like Sony Ericsson, into the North American market. She co-founded Studioe9 in 2004, which functioned as an independent digital laboratory servicing global advertising agencies including IRIS Nation and TBA Global. At StudioE9, Elizabeth emerged as the driving force behind the creation of some of the first public/private partnerships of their kind such as Maiden Nation. Her efforts focused on job creation for women in developing countries through ethical fashion.